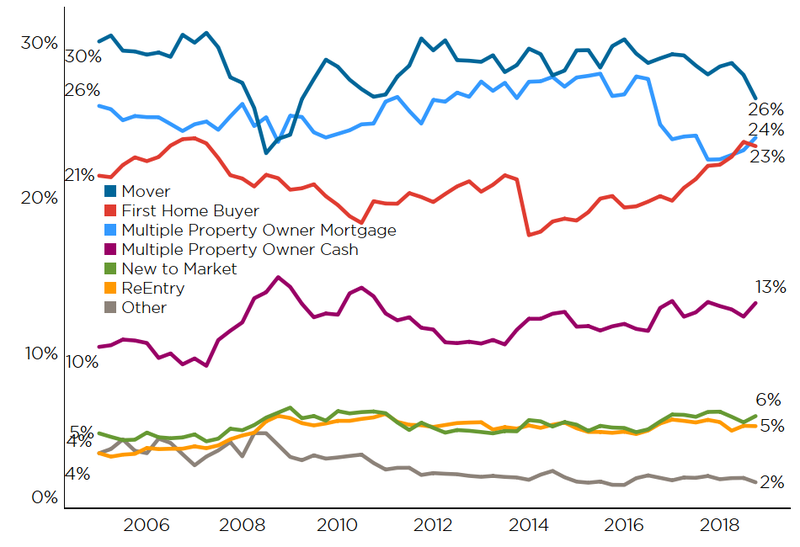 The big stories of 2018 in our CoreLogic Buyer Classification data were the continued activity from first home buyers (FHBs) and mortgaged multiple property owners, but the inactivity from movers (i.e. existing owner-occupiers). Even in Auckland, where average values are above $1m, FHBs managed to raise their share of purchases last year. Christchurch and Wellington were also hot markets for FHBs in 2018. With overall sales activity unlikely to surge higher in 2019, we reckon the key point of interest will continue to be how each buyer group fares in terms of market share against the others. Broadly speaking, it looks to us that the worst has passed for the downturn in residential property sales activity across the country and that volumes have found some kind of floor at around 85,000 transactions per year. So within that low-volume market, who’s active and who’s not? 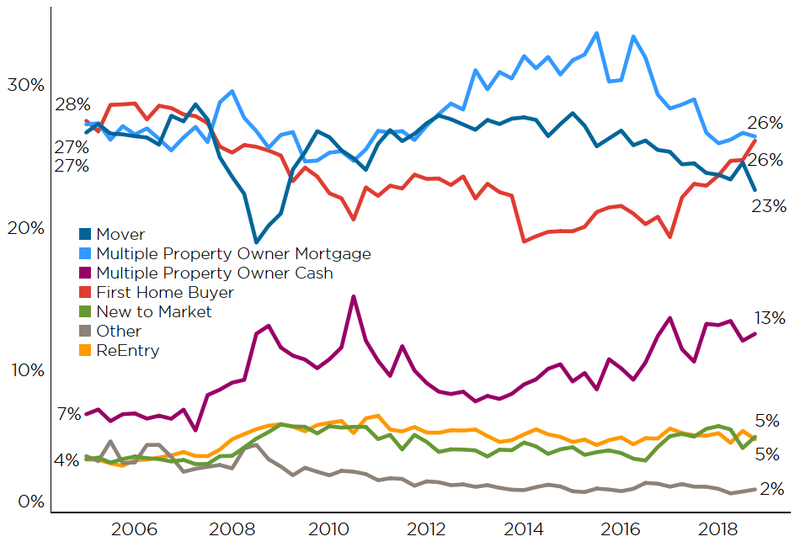 Our proprietary CoreLogic Buyer Classification data shows two differing stories – keenness to buy from first home buyers (FHBs) and mortgaged multiple property owners (MPOs), offset against happiness by movers to just stay put. Indeed, in the final quarter of 2018, the share of purchases going to movers - i.e. existing owner-occupiers - dropped to 26% (5,991 deals), down from 28% (6,148 deals) a year ago. 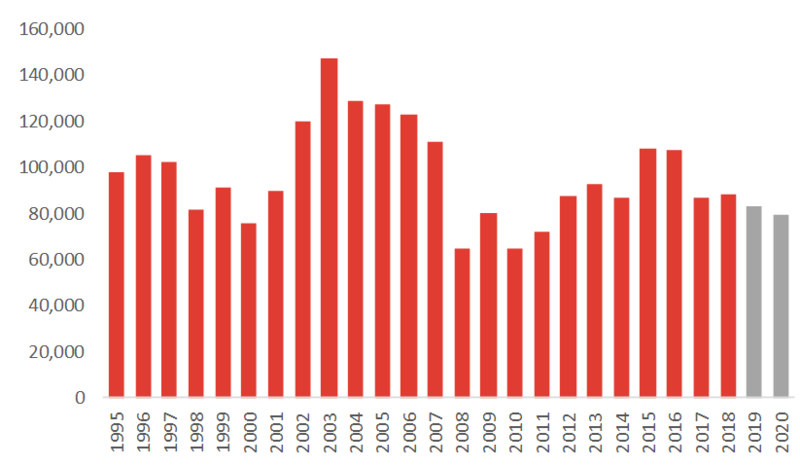 As the first chart shows, the latest figure was also their lowest market share since mid-2009. Clearly, factors such as the high costs to move house (e.g. 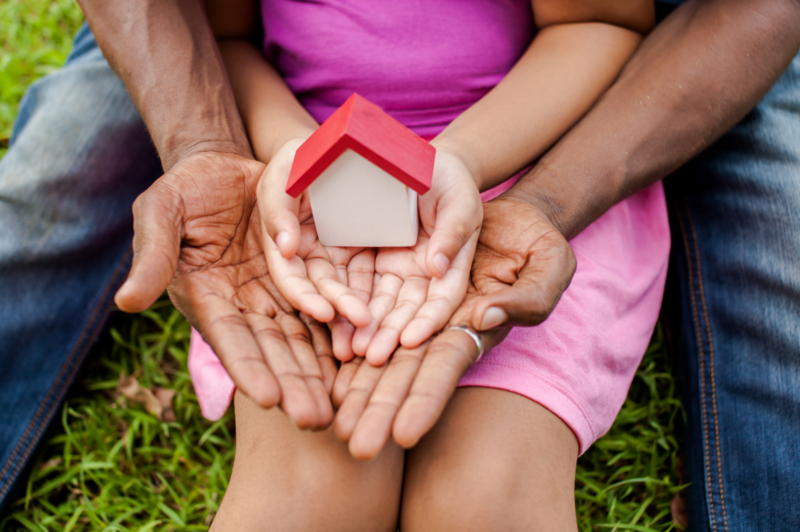 legal and agency fees), the extra money required to trade up, and the restricted ability to secure that money by way of a mortgage are all keeping existing homeowners where they are. By contrast, mortgaged MPOs raised their share of activity to 24% (5,531 deals) in the final quarter of last year, up from 23% a year earlier (5,050 deals) and the highest figure since mid-2017. Yet again, there’s no evidence here that the looming ring-fence for rental losses or the longer term potential for a capital gains/income tax are deterring investors from purchasing more properties. Similarly, FHBs remain active and their continued presence in the market was probably the big story of 2018 in terms of buyer classification. Despite high prices and low affordability in many parts of the country, FHBs raised their share of purchases from 22% in Q4 2017 (4,831 deals) to 23% in Q4 2018 (5,300 deals). The figures for Auckland are perhaps the most notable – even with average property values of more than $1m, the second chart shows how FHBs accounted for 26% of purchases in Q4 2018, the highest reading since mid-2008. Access to their KiwiSaver funds for the deposit is likely to have been a key support for FHBs right across the country. The story in Christchurch is also all about FHBs. As the third chart shows, although their share of purchases dipped back to 26% in the final quarter of last year, that was still a higher figure than anything seen prior to 2018. As we’ve discussed before, some movers in Christchurch are choosing to relocate to the neighbouring Selwyn and Waimakariri districts, which is freeing up stock for FHBs in the city (and to a certain extent mortgaged MPOs). We suspect that sales volumes are unlikely to move upwards significantly in the short term (see the fourth chart), although the latest loosening of the LVR speed limits may stimulate a bit of extra activity over and above our modelled forecast. 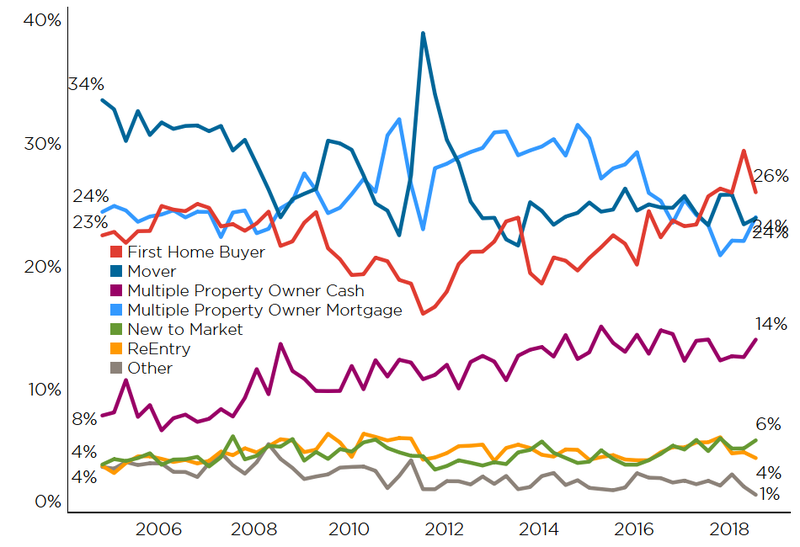 So in the flat overall market, it’ll be interesting to see how each of the buyer groups fares against each other as 2019 progresses.